Greg Saw holds onto the overall leader jersey, but today's elite stage winner at Irvinebank Cory Wallace decreases the gap to 8:55 minutes. He claimed today's win ahead of Ramses Bekkenk (Ned) and Milton Ramos (Esp) on a marathon race track that was said to be an “old school” Crocodile Trophy stage with wide open Outback fire trails through rough mining country in and around Irvinebank. 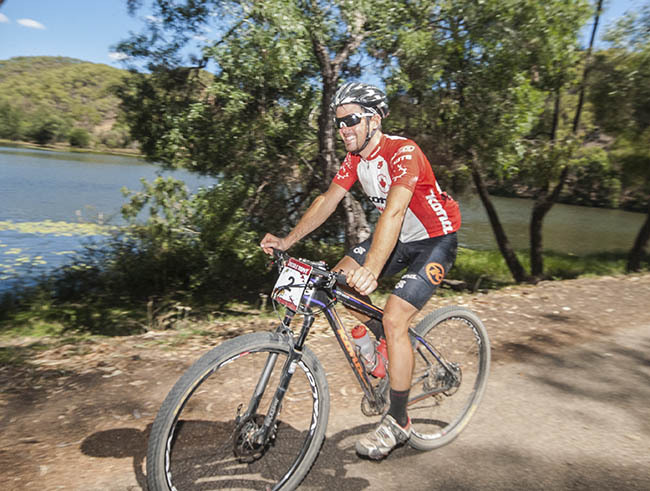 “That was one of the hardest days on a mountain bike in my whole life”, said Andrew Hall from Canberra, who wears the Amateur Leader Jersey after Stage 6 at the 20th Crocodile Trophy. The endurance cyclist from Canberra is one of the many Australians at the start this year and was impressed by the race track composition. “The first few days were a lot of fun – those trails in Cairns and Atherton have really enriched the Crocodile Trophy track portfolio”, he said. Of today's race he said that it had been an “old-school Croc stage”, just like he'd been told about until a few years ago, when the event started to venture further onto old mining and rainforest trails and to attract more local riders – this year a more than a third of the field is Australian. In a first for the Crocodile Trophy all amateur category leads are currently held by Australians: Jindra Knot (A1) from Sydney and the three Canberrans Andrew Hall (A2), Jason Chalker (A3) and Garry James, who has claimed the sixth consecutive stage win today, lead overall. To recognise this development organisers had launched a “Best Australian” leader jersey in 2012 and since stage one it's recipient has been Ondrej Slezak from Sydney, who was born in the Czech Republic and only just recently became an Australian citizen. He said that he was proud to represent his new home country at the Crocodile Trophy, which is a great success for his Way2Life Quantum Racing Team, which is based in Sydney. Ivan Rybarik again placed among the top elite positions today and in the Amateur 1 (Under 30) categories, Jindra Knot and Andrew Lloyd get great results daily. After a tough start where his legs didn't seem to obey on the first climb onto Mount Misery, Cory Wallace found his rhythm between the first and second feedzone, which suited him. “The lead group just rode away from me in the beginning, but I got in the zone on the technical section after the first depot”, he said. “As soon as I heard that I wasn't too far and started pushing hard to catch up – on the next climb I attacked and got away”, he recounted his wild chase in which he got a three minute gap back and even crossed the line 1:16.41 ahead of Ramses Bekkenk and Milton Ramos from Spain. With three stages to go, the overall leader board remains the same: Greg Saw holds an 8:55 minute lead on Cory Wallace. Ramses Bekkenk is still in third ahead of Milton Ramos and Ivan Rybarik. “This year the elite field is very strong, there are a lot of fast guys, which provides for an exciting racing experience – the gaps look considerable, but at such a long stage race and especially at the Crocodile Trophy, where the conditions on the riders' bodies and bikes are particularly challenging, even a small mechanical issue can reshuffle the cards”, said organiser Gerhard Schoenbacher today. For the first time his 100 competitors and almost as many staff and crew will move into Skybury Coffee Plantation tomorrow, which will be the destination of the seventh stage in 2014. The riders and supporting crew are looking forward to spending the night in the lush surrounds of the papaya and banana plantations – and their delicious coffee, naturally.